The holiday season is upon us, filling our calendars with holiday parties and festive celebrations. In addition to the fun, the holidays often bring heightened risk for employers. This year, there’s a new risk in town – cannabis. Here is your Employer Guide to Holiday Parties, with minimized risks. This year, there’s a newly legal kid in town – cannabis. We recently asked Brandon Hillis, Employer & Labour Lawyer with Roper Greyell LLP, to share his take on providing and allowing cannabis at company sponsored events. Have you updated your policies to include cannabis yet? Check out our downloadable Employer Guide to Cannabis Legalization to get started. Here are 10 tips to help you limit your potential legal headaches as an employer – so that you can focus on having fun! Clearly Communicate Expectations: Share clear expectations regarding the use of alcohol and cannabis at holiday parties. Include policies and expectations in the invitation & reminders to employees. Reiterate expectations for conduct and social media. Be inclusive. From religion to sexual harassment and everything in between, holiday parties have historically been a high risk environment for discrimination – intentional or otherwise. Be sensitive to the needs of your workforce when choosing the theme, food, beverages, time, date, and more. Lead by example. Encourage managers to lead by example, consuming responsibly or not at all. Engage with guests throughout the event, mingling with everyone. Manage Consumption: Limit alcohol intake by opting for a ticket or cash bar. Monitor intoxication levels, and don’t allow guests who appear impaired to continue consuming alcohol. Provide a range of food and non-alcoholic beverages during your event. No (Wo)man left behind: Offer employees a safe ride home, through taxi vouchers, group transit, or transit passes. Be sure to ask guests whether they have a safe ride home as they depart. Cover Your Bases: Confirm you have adequate insurance coverage. Consider choosing a venue with a liquor license – this also means insurance coverage, safe food preparation, flexible transportation options, and trained bartenders. The holidays are a time to celebrate! 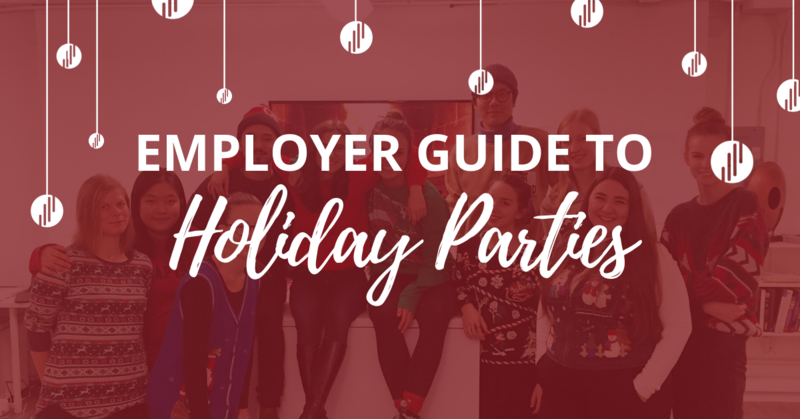 Use this Employer Guide to Holiday Parties to plan and execute a safe and risk-free celebration for everyone to enjoy. Happy Holidays! Be the first to hear about new articles, tools, events, and more.